The power is on once again as TokuNation showcases another in it’s ongoing series of toy galleries focusing on the original Mighty Morphin Power Rangers Movie! 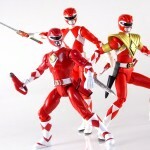 We’ve taken a look at 5 figures so far in Bandai of America’s Power Rangers 5″ Legacy Line for the film and today we’re taking a look at the last of the 5 core rangers, the Legacy Mighty Morphin Power Rangers Movie Yellow Ranger! As with our previously reviewed Movie Rangers this figure marks the first time ever that the Movie Yellow Ranger has been portrayed properly in toy form. While nicely detailed the articulation is a mixed bag though the accessories partially make up for this. The Legacy Movie Yellow Ranger specifically comes with her Power Blaster sidearm as well as a holster for it. In addition to this is the movie exclusive Power Beam helmet! Allowing Aisha to shine bright head lamps from the Sabretooth Tiger’s eyes the toy replicates the look of this alternate helmet, without the lights of course. We break down the ins and outs of this figure, both positive & negative, in the review after the jump. We’ve attached a selection of images to this post but the full gallery thread contains over 50 images of this highly anticipated new figure. Be sure to check out the images & full review, with more than a few fun bonuses included. We return later this week with the FINAL gallery in this series, the Legacy Movie White Ranger! TokuNation is back to action with a new installment in our ongoing series of toy galleries focusing on the original Mighty Morphin Power Rangers Movie! 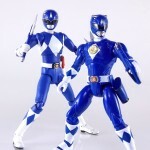 We’ve taken a look at 4 figures so far in Bandai of America’s Power Rangers 5″ Legacy Line for the film and today we look at a another, The Legacy Mighty Morphin Power Rangers Movie Blue Ranger! As with our previously reviewed Movie Rangers this figure marks the first time ever that the Movie Blue Ranger has been portrayed properly in toy form. While nicely detailed the articulation is a mixed bag though the accessories partially make up for this. The Legacy Movie Blue Ranger specifically comes with his Power Blaster sidearm as well as a holster and the Stega Stinger! A grappling hook device used briefly by Billy in the film. We break down the ins and outs of this figure, both positive & negative, in the review after the jump. We’ve attached a selection of images to this post but the full gallery thread contains over 50 images of this highly anticipated new figure. Be sure to check out the images & full review, with more than a few fun bonuses included, and be sure to share your thoughts on the 5″ Legacy Blue Ranger in our gallery thread! Haven’t had enough of the old Ooze yet? Well our frequent contributor and friend Baltmatrix is back with a new video review to satisfy your needs! Today Balt’s taking a look at the Power Rangers Movie Legacy 5″ Ivan Ooze figure! 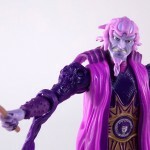 A recent entry in Bandai of America’s Toys R Us exclusive Power Rangers Legacy line, Legacy Ivan Ooze aims to recreate this movie exclusive villain as he originally appeared. Check out Baltmatrix’s video review below to see just how well the figure turned out. And be sure to check out TokuNation’s recent gallery of this figure. In fact we just celebrated our 400th toy gallery with a look at both the Legacy Ivan Ooze figure, as well as the vintage Evil Space Aliens Ivan Ooze from the original Mighty Morphin Power Rangers toyline! Be sure to check out the above video all 80 images, then let us know what you think of both figures in the poll attached to the discussion thread. 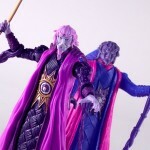 Ivan Ooze Vintage & Legacy Figures, Special 400th Double Gallery! TokuNation has been hard at work and finally we are proud to present our monumental 400th gallery special! That’s right! In just over 3 short years TokuNation has posted 400 toy galleries ranging various television series and toy lines. So in honor of today’s 400th gallery entry we’ve got a 2-for-1 for you. Gallery 400 features both the vintage Evil Space Aliens Ivan Ooze figure from the original Mighty Morphin Power Rangers toyline AND the modern 5″ Ivan Ooze from the Power Rangers Legacy toyline! This double gallery features comprehensive reviews of these 2 unique figures as well as 40 images of each! We’ve even thrown in some comparison shots of the two together! With the 20th anniversary of Mighty Morphin Power Rangers the Movie mere months away, what better way could we begin our celebration of it than to bring you a double dose of one of the most often looked over villains in toku history! We’ve also attached a poll to the discussion thread after the jump, so sound off and let us know which Ivan Ooze you prefer to terrorize your Power Rangers collection! 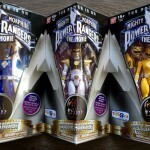 Apparently the trio of Legacy Original MMPR Movie figures that have yet to be released up to this point, the Blue White & Yellow Rangers, have turned up at retail! Ebay seller darthbane[/URL] based out of the Pallatine, IL area has listed several sets[/URL] of these figures for sale. Just fair warning but they are a bit above retail price. The good news however is that you should be on the lookout for these new figures to hit your nearest Toys R Us shelves in the coming weeks! Let us know if you spot these new releases by posting in our Toy Sightings forum! The hunt is on! Once again TokuNation is giving you a blast from the past! We’ve been taking a look at brand new figures from Bandai of America’s Power Rangers 5″ Legacy Line, and today we’re looking at the original Mighty Morphin Power Rangers Movie Pink Ranger! 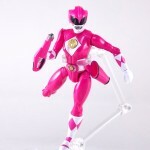 As with our previously reviewed 5″ Movie Red Ranger & Black Ranger this figure marks the first time ever that the Movie Pink Ranger has been portrayed properly in toy form. While nicely detailed the articulation is a mixed bag though the accessories partially make up for this. The Legacy Movie Pink Ranger specifically comes with her Power Blaster sidearm as well as a holster and the Pterodactyl Thunder Whip! A weapon that could stun or electrocute enemies in the film. We break down the ins and outs of this figure, both positive & negative, in the review after the jump. We’ve also attached a selection of images to this post but the full gallery thread contains over 50 images of this highly anticipated new figure. Be sure to check out the images & full review, with more than a few fun bonuses included, and be sure to share your thoughts on the 5″ Legacy Pink Ranger in our gallery thread!